[CONT](VC/RC):During your turn, this unit gets [Power]+3000 for each card in your soul. [ACT](VC/RC)1/Turn:COST [Put two cards from your hand into your soul], and draw a card. [AUTO](VC/RC):When its attack hits, you may Counter Blast (1). If you do not, put all of the cards in your soul into the drop zone. So we got Skull Dragon except for Pale Moon. Well, we can’t expect RG columns this meaty without restrictions, so having to spend one CB per hit is fair enough. 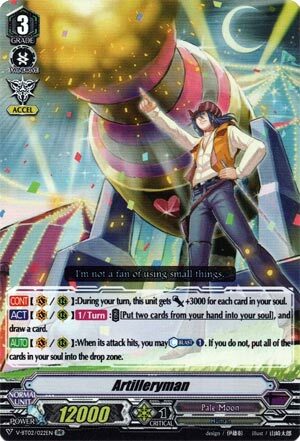 Problem is, that pretty much relegates this card’s role to attacking the vanguard only, as something this big? No way the opponent will want to throw away so many guards to keep it, no matter how important it is. The draw skill is basically nothing you’re going to use as you already soulcharge enough without this and going -1 just to load up cards with Golden Beast Tamer or provide Alice Soulblast just isn’t worth it. All in all, useful at like 2 copies just for some bite that isn’t just multi-attacking. Also has Accel Gift: without that I wouldn’t recommend it at all.